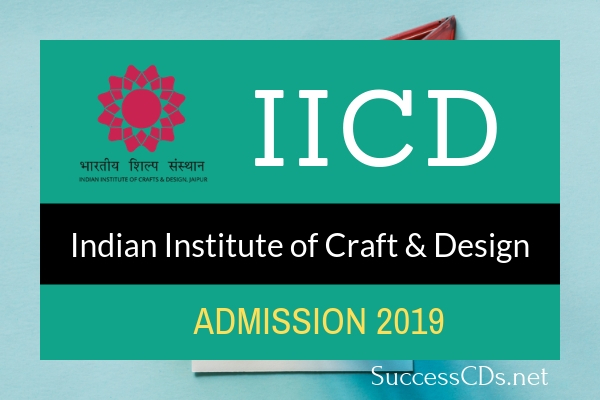 IICD Jaipur B.Des and M.Des Admissions 2019 - The Indian Institute of Crafts & Design (IICD) has published the admission guidelines for admission to various UG and PG Professional Diploma Programme for the academic session 2019. Application are invited for admission to various UG and PG Program Offered by the institute through the Entrance Test 2019. Official website IICD offers the following UG and PG degree programmes in Crafts & Design for the Admission 2019. Should have completed 10+2 from a recognized board of education. Students who will be appearing in the qualifying examination are also eligible to apply. Should have completed Graduation in any discipline with an aptitude towards craft, fashion or design. Students who will be appearing in the qualifying examination are also eligible to apply. The Candidate has to opt for the specialisation during filling up the personal, other details in the Online Registration form, prior to Entrance Test. Candidates who are Design/ Architecture graduates can directly be admitted to 2 years M.Voc. programme after clearing the entrance test. Candidates who are graduates from any discipline other than Design/ Architecture, are eligible for M.Voc. after completion of 1 Year PG foundation offered at IICD, which means M.Voc. will be 3 years for non design background graduate. Reservation Policy as per UGC norms. IICD Entrance Test 2019 is conducting in two parts i.e. Part A – General Awareness, Creativity & Perception Test and Part B – Material, Color & Conceptual Test, Personal Interview. IICD admissions 2019 will be done on the basis of a candidate’s score in the exams and performance in the interview round. Overall Personal Achievements in academics and co-curricular activities. The candidate has to indicate his/her choices of 3 (three) Test centers in order of preferences. IICD reserves the right to cancel or change the test center/date. Any such changes will be communicated to the registered candidates. Candidate has to bring at least one original (not photocopy or scanned copy) photo identification (Id-Card). The name and signature on the photo identification must match the name that has been entered in the Registration form by the candidate. Acceptable forms of photo identification types are limited to Driver’s License, Passport, PAN card, Voter ID, UID or Identity card of last school. The reservation policy is as per UGC norms. Generally, percentages of categories for admission in IICD are as follows: 27% for OBC, 15% for ST and 7.5% for SC and 3% for PH candidates. If the email is not received the applicant is requested to contact to the admissions@iicd.ac.in with the bank statement / card transaction proof. In case, the uploaded documents are not within acceptable limits, the candidate will receive an email to resend the documents in the acceptable format, after that the application will be processed. The Admission process fee for Indian Candidates is Rs.1,500/- (Rs. One Thousand Five Hundred only) and for NRI/ Foreign National Candidates is Rs. 3000/- (Rs. Three Thousand only). This fee is non-refundable.